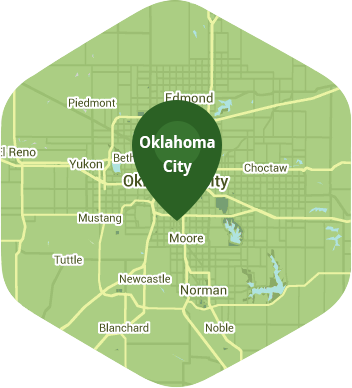 Book a skilled lawn pro in Edmond. Backed by a total satisfaction guarantee and amazing customer support. Edmond is a great place to live, with its excellent schools, safe streets, and neighborhoods full of young professional families like your own. Add to that a vibrant arts scene and lovely parks, and you really do have the perfect suburb. Edmond's motto is "A Great Place to Grow", and Lawn Love is here to help your lawn get the message. Whether it's picking just the right drought-resistant seed or mowing at exactly the right height to maximize health, our independent lawn care professionals know lawns, and know how to get your lawn looking plush, green, and perfect. And all of this expertise is literally at your fingertips, with convenient online booking and payment options. Contact Lawn Love today at 405-926-8318 or take advantage of our two-minute quote, and then put your feet up and let us take care of the work! Rated 4.75 / 5 stars in 3,720 Edmond customer reviews. There won't be any rain in Edmond today, which means you'll probably have to water your lawn. Dusk and dawn are the best times to water your lawn (the sun will rise at 6:46 AM and set at 8:10 PM today in Edmond). Here are some average lawn care prices for homes in Edmond. Average lawn size 8,218 sq. ft.